On March 5, 2018, members of the San Bernardino County Human Trafficking Task Force began surveillance in the downtown area of San Bernardino, in an attempt to locate a runaway juvenile who was possibly the victim of human trafficking. At one point, investigators observed Nichole Williams, a 19 year-old female from Fresno, walking with the victim to a vehicle near the 600 Block of 6th St. and attempt to leave the area. A traffic stop was conducted, and through investigation, it was determined Williams was Trafficking and Pandering the female juvenile victim. Williams was arrested and transported to the Highland Police Department for an additional interview. 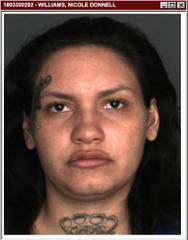 The juvenile victim was rescued and released to San Bernardino County Department of Child and Family Services. Williams was later transported to Central Detention Center and booked for felony charges of Human Trafficking and Pandering. Bail is set in the amount of $150,000.